Medio Cuerpo (Half Body) is a project that focuses on fascination with architecture and our ability to experience it physically. Various forms and levels of interpreting space are merging with each other, forming one whole. Rigid architectural divisions, soft organic forms, imagined architecture, light, consciousness… We are invited to gradually experience various forms, to discover meanings, but most importantly, to cross established boundaries, in both physical and mental space. 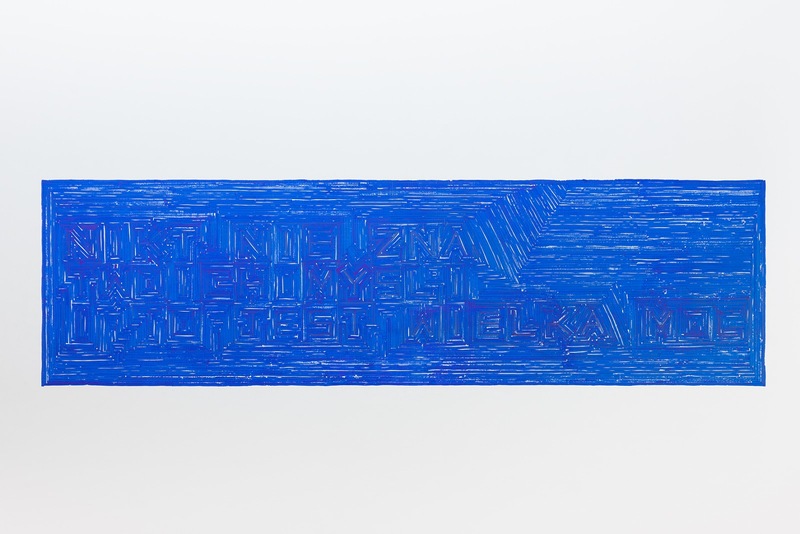 The starting point for the project by Brazilian artist Marlon de Azambuja was his fascination with the architecture of Poznań’s Galeria Miejska Arsenał. For many years, his careful observation of space and attempts to change its perception through subtle interventions have been reappearing in his work, in both indoor projects and those interfering with elements of urban architecture. Azambuja tries to model existing structures and unlock their sculptural potential, so that the viewer will not only look at a given place from another perspective but also feel a bond with it. The artist’s special obsession are forms and structures, not noticed immediately, which he restores in the viewer’s consciousness. 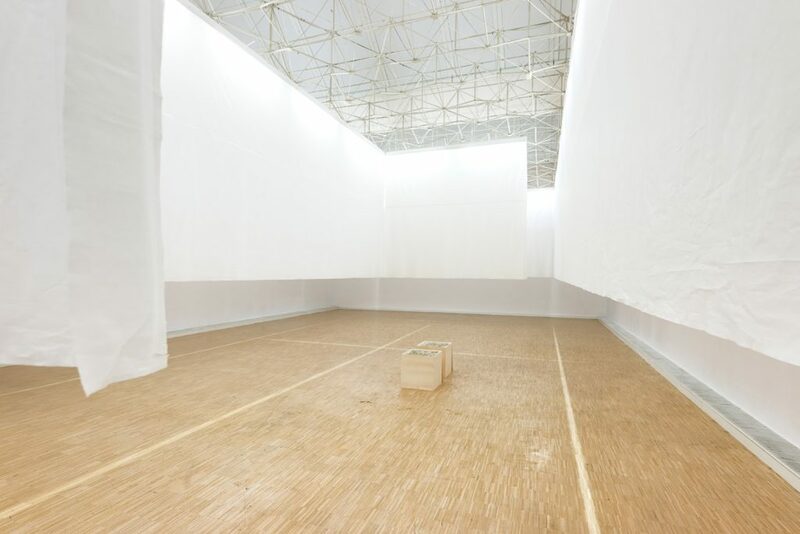 We can see a similar phenomenon here, in the case of the site-specific Medio Cuerpo installation. The spectacular, though complicated, structure of the ceiling, which constitutes the dominant feature of Arsenał’s architecture, causes the main dividing lines – i.e. 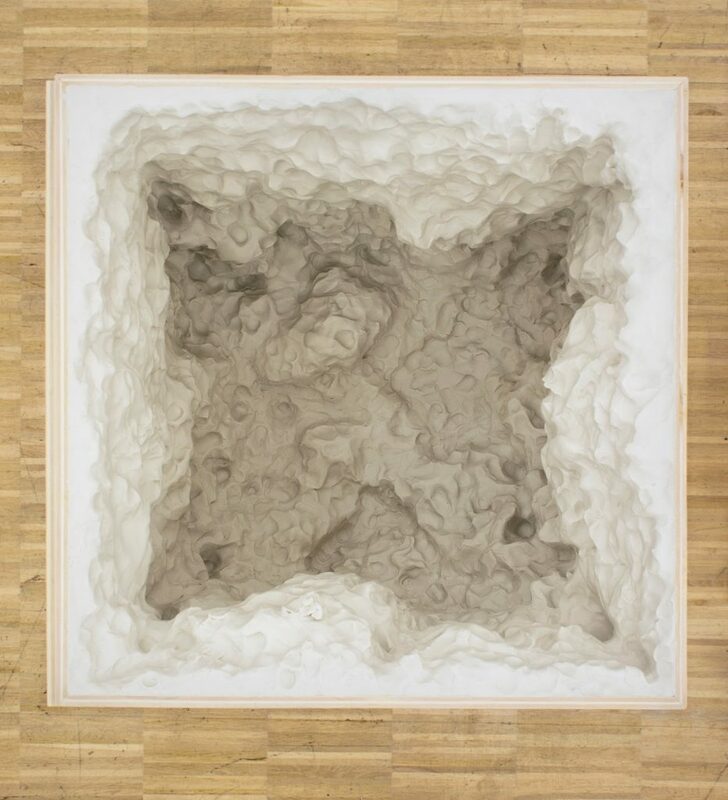 the shape created by the electrical installation – to disappear. Azambuja brings out this particular form and emphasises it by introducing light and fabric into its structure. 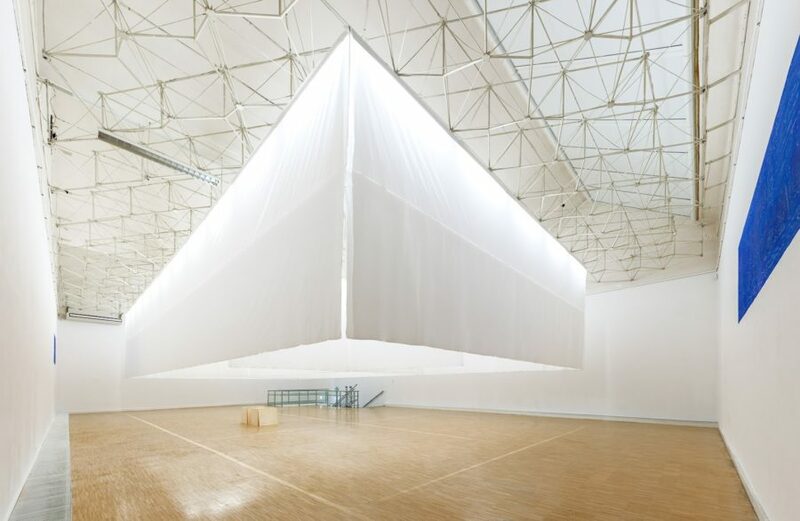 In this way, he creates partially suspended walls, whose continuation we can feel only intuitively, and whose culmination is a line of light emerging on the floor. The subtle line reflects the linear division of the ceiling. 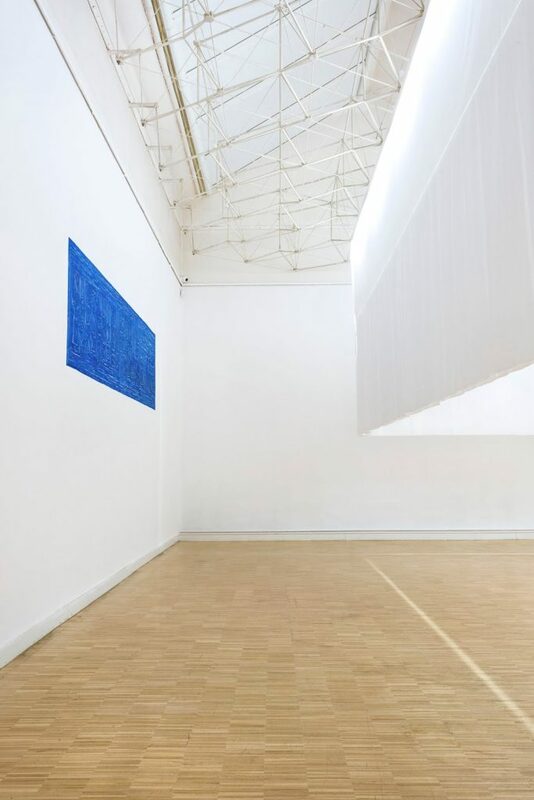 Subtlety harmonises here with monumentality, while rational and rigid spatial divisions are translated into the language of soft, organic or even immaterial forms, thereby stating that the exhibition should not be interpreted too narrowly. Azambuja deliberately creates divisions within divisions, confronting us with them. He studies and observes how we behave in this space, whether we will try to form a relationship with it, whether we will decide to bend down and look under the fabric, whether we will cross this fragile border formed by invisible walls and divisions of light. Thanks to this unique experiment, the artist invites us to establish a physical relationship with the space, to become aware of it through our body and movement. He activates our relationship with the place and encourages us not only to look at it but also to discover, transcend and explore it. When going “into” the exhibition, we gradually become aware of this peculiar game and notice other works that participate in the experience, enriching and complementing each other. Another important element of the project are works from the Pensamientos (Thoughts) series. Placed within Medio Cuerpo, they lure us with their simplicity and intimacy. These cube-shaped boxes in various formats are filled with soft plastic material. As early as the initial examination, we can become aware of a reference made to the original understanding of the enclosed space, limited from all sides. The cube remains an ideal form, a perfect “container”, a representative of the rational space or, as in this case, of the mind. Inside it, Azambuja produces organic shapes – thoughts. They come into existence thanks to the movement of hands, which the artist immerses in soft plasticine while pondering on various topics he has set himself. By means of this simple procedure, a “magical object” is created in which the artist’s thoughts are recorded. In a poetic way, reflections that are difficult to express are “translated” into the language of tactile forms. Situated within architectural divisions, Pensamientos require a reception totally different from that of Medio Cuerpo. We leave the monumental architectural space and bend down. The works attract our attention, draw us into their reality, encourage us to look deeper, maybe also inside ourselves. Intimate or even sensual, they have the power to introduce us to the world of ideas. 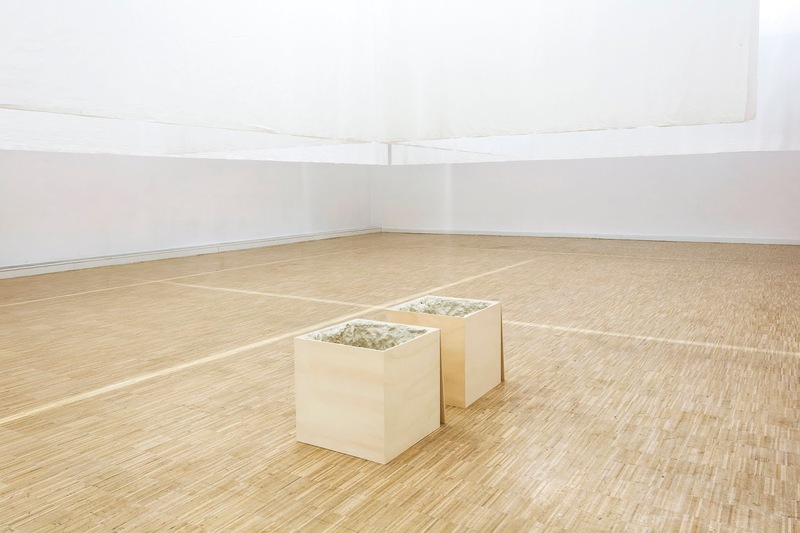 The works from the Sentencias espaciales (Spatial Sentences) series – the third element of the exhibition – also require a slightly different reception. They are located outside architectural divisions, outside the Medio Cuerpo structure. At first, we can perceive them as monochromatic, abstract reliefs, but on closer inspection we can notice words emerging from overlapping planes. One of the key sentences expresses their character most fully: “No one knows your thoughts, and this is powerful” The artist’s strong relationship with architecture, as well as the tangible and corporeal nature of its reception, led him to reflect on space also metaphorically, where thinking about physical architecture merges with thinking about “mental architecture”. Azambuja imagines the area of our thoughts as a place, a bunker of sorts, to which no one has access from outside, where our traumas and innermost desires are hidden. This is a place whose boundaries we set ourselves, often artificially and pointlessly. “… no one is looking – think” says the artist, as if he wanted to tell us: do not be afraid to think, to cross borders, to expand your consciousness or your mental space. These sentences have been deliberately inscribed on the Arsenał walls. Azambuja is perfectly aware that this is the space of an art gallery. The meaning of the sentences goes beyond architecture, metaphorically “demolishes” the institution’s walls and is in harmony with the purpose of an art gallery in general. After all, what else should it be, if not a place where one challenges common ways of seeing things, where one strives to establish a relationship between art and the viewer, where meanings are deepened and released? © Marlon de Azambuja, Galeria Miejska Arsenal, Poznan POLAND E.U.